As a nonprofit organization, you rely on donations and fundraising efforts to maintain your organization and fund your purpose. This means that marketing your nonprofit comes with unique challenges. Unlike traditional businesses that can market a product or service that is of interest to the consumer, where the consumer gets something in return for their money, you’re having to appeal to the “giving” side of human nature, rather than the “What’s in it for me?” side of human nature. Not a small feat, for sure. Stories show purpose of the organization from the beginning – the why behind your mission – to the desired end result. People care about people more than facts and figures. By connecting on an emotional, heart-felt level, you’re able to tap into the altruistic side of a possible donor. This shows the end result and success of what you do, proving to a donor that you do provide positive outcomes and your donors are key to making a difference. Your nonprofit’s story can’t be one story that serves all purposes at all times – an about page on your website, a brochure, or a welcome email. Doing this will make your story sound boring and inauthentic which will quickly cause possible or active donors to lose interest. Your story needs to be a living entity that can be used for a variety of marketing purposes. 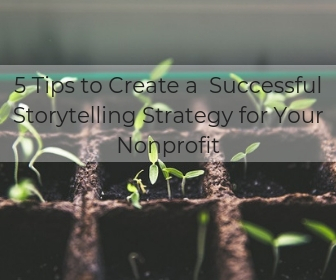 By having a storytelling strategy, you can maximize its effect, putting it to work for you in a variety of different situations, such as leveraging holidays, and build strong connections with your prospective and active donors throughout the year. When you put your story to work for you, you’ll see an increase in donations and improved success for your fundraising activities. Facts and figures, or showing hundreds of photos of struggling people, turns away donors. Either they feel overwhelmed, like they can’t help at all, or they simply can’t connect with a massive group of people. However, donors can identify with and care about one person or one family. This is actually a psychological effect called Identifiable Victim Effect. As you portray your “main character,” you have an opportunity to show the reality of those you’re helping’s situation and make difficult, complex issues more tangible to potential donors. Also, by portraying one main character, your donors see how they can help one person become successful or live a better life and know they’re making a difference. Once you choose who you want to represent your nonprofit and tell their story, it’s important to portray the individual or family with dignity and to not portray your organization as the “savior.” Getting permission and explaining your subject’s role in your organization is important from a transparency and ethical standpoint. Tell the outcome of the protagonist’s story and how their life is now, what has changed about their situation. You don’t necessarily have to tell this story yourself. In fact, videos of a person telling their own compelling journey are a great way to connect your protagonist directly to your audience! At the end of their story, talk about how donors made this and hundreds/thousands of positive outcomes possible, so you can lead into your call to action for donations or to market a fundraising campaign such as product sale. Now that you have your story, what next? It’s time to put it to work for your organization. You want to tell your story as soon as a potential or current donor arrives at your website. By putting it close to the top of your homepage, it’s easily seen and can make an immediate impact. Email 1: Thank them for subscribing, introduce them to your organization and mission, and at the end, tell them you’re excited to share your protagonist’s story with them. Email 2: Share your story and include a powerful call to action about how they can help more people like your protagonist. Email 3: Remind them of the story, share some facts and figures behind what you do (we know we said to avoid facts but since you’ve already connected a face, it’s okay to include the scope of the issue) along with an additional powerful call to action. Pair your story with important dates for your nonprofit, such as specific fundraising campaigns, the anniversary of the founding of your nonprofit, and national charitable drives like #GivingTuesday. Send out email blasts, leverage social media, and create marketing campaigns with your story front and center. Remember, we said it’s important that your story is a living entity so it maintains interest and authenticity? Provide updates to your story, such as your protagonist a year after the original campaign to renew interest. Also, you can and should share new stories regularly so you can continue to share on social media, update your website, and also share your successes! At Capital Business Solutions, we take pride in helping nonprofits improve their processes and save time and money. We provide nonprofit fund accounting and financial management software to help you maintain your donations and finances with ease and efficiency! Contact us at 888-249-6008 to learn more.